Posted on 10, October 2018 by FactMR | This entry was posted in Agriculture, Austria, Belgium, Business, Commodities, Denmark, Economy, Food & Beverage, France, Germany, Iceland, Industrial, International Trade, Investment, Ireland, Netherlands, News, Norway, Poland, Retail, Sweden, Switzerland, United Kingdom and tagged ConAgra Brands non-dairy toppings, Europe non-dairy toppings market, FrieslandCampina Kievit non-dairy toppings, frozen non-dairy toppings, liquid non-dairy toppings, non-dairy toppings, non-dairy toppings market, Paleo diet, powder non-dairy toppings, Puratos non-dairy toppings, soy milk non-dairy toppings, vegetable oil non-dairy toppings, Whole30. Bookmark the permalink. DUBLIN 2, Ireland, 10-Oct-2018 — /EuropaWire/ — The Europe non-dairy toppings market revenues continue to head north, as the growing vegan population ramps up demand for non-dairy ingredients. Shelves and aisles across European retail stores and hypermarkets have been observed with heightened penetration of dairy-free ice-creams. Higher visibility of non-dairy products on retail shelves substantiate the heightened demand for ingredients used to process such products, and non-dairy toppings are no different. 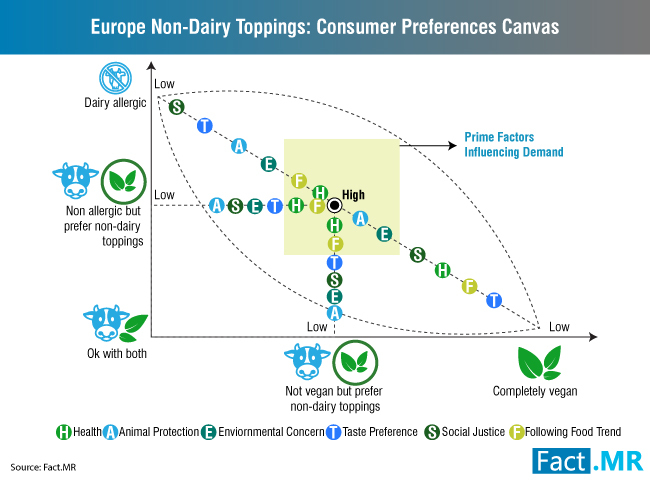 Over the years, the number of Europeans preferring non-dairy dairy products has increased significantly, and by second quarter of 2018, over one percent of European population was identified to be vegan, says a report published by Fact.MR on non-dairy toppings market.